Sorochany winter park is located about 50 km from Moscow in the countryside village Kurnikovo. At the park you can go skiing, snowboarding and snowblading on 10 tracks (their length is from 400 to 1000 meters). Slopes are with 80-90 m drop. Of course, they differ in levels for beginners, intermediate and professional skiers. There are about 2000 skis and snowboards for rent, a big car park, two restaurants with vast dinner area, a cozy cafe and the hotel. If you like you can also get a personal instructor. There are modern four ski lifts and one for kids, a tubing centre which is exciting for the whole family and enjoyable even for those who don't much fancy doing winter sports. It's open in the nighttime (generally till 2-3am) and lit with searchlights, so it's really safe. Isn't it great to have a ride under twinkling little stars with soft snowfall? 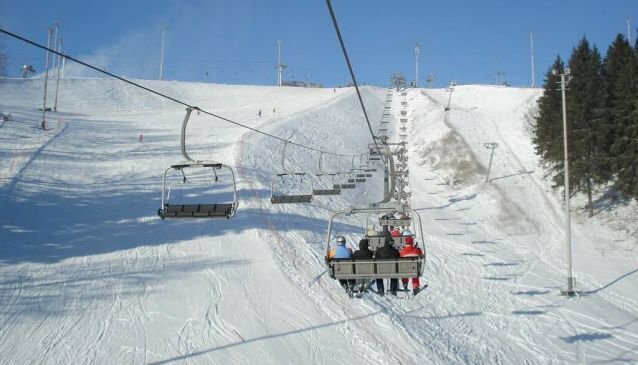 All slopes are equipped with snow cannons to supplement natural snow when there is lack of it so the ski resort has a climate-controlled environment which allows to extend the ski season. The resort is easy to get to, you can go by train from Savelovsky railway station to Yakhroma, then take bus ?42 to Kurnikovo village. Going by train and bus will take about 1.5 hour. You can also get bus ?401 from Altufyevo metro station and go to the bus station in town Dmitrov, then change the bus to bus 42? which goes to Kurnikovo. Ski/Snowboard rental is about 200-300 rubles per hour; total winter ski/snowboard equipment to rent may cost about 700-800 rubles per hour. The park is open every day from dawn till night.